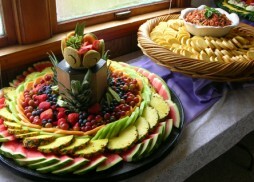 O’Sheas Catering and Events offers a wide range of menu options suitable for all types of events across Tacoma, WA. 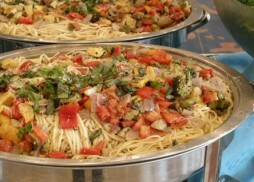 Menus by O’Sheas Catering are created with the freshest fruits and vegetables, imported pasta products, hand-cut quality meats and the finest seafood available. Herb, Whole Grain and Crusty Butter Flake. Served with Whipped Honey Butter. Assorted Melons, Pineapple, Cherries, Kiwi, Strawberries, Raspberries, Blueberries, Grapes, Apples and Oranges. Mini Muffins, Mini Scones, Mini Bagels, Mini Cinnamon Rolls, Raspberry and Apple Strudel Sticks. Cranberry, Orange, Apple, Grape and Tomato. Regular and Decaf Includes Sugar, Sweet and Low and Creamer. Includes Plates, Forks, Knives, Napkins, Cups and Stirrers. Assorted Melons, Pineapple, Cherries, Kiwi, Strawberries, Raspberries, Blueberries,Grapes, Apples and Oranges. Mini Scones, Mini Muffins, Mini Bagels, Mini Cinnamon Rolls, Raspberry and Apple Strudel Sticks. Cascade Bagels freshly made assorted Bagels and Cream Cheese. Cascade Bagels freshly made Strawberry, Raspberry, and Blackberry Scones. Bacon and Cheddar, Vegetarian, Quiche Italiano, Quiche Florentine or Quiche Lorraine. Filled with Scrambled Eggs and melted Cheese: Choice of Ham, Bacon, Sausage or Vegetarian (Whole Wreaths Only, 20 Slices per Wreath). Bacon, Sausage Links or Ham Steak. Oven roasted Baby Red and Yukon Gold Potatoes with Sweet Bell Peppers, Red Onions, Ham (upon request)$2, Parmesan Cheese, and Seasonings. 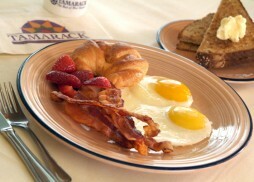 Filled with Scrambled Eggs and melted Cheese Choice of Ham, Bacon, Sausage or Vegetarian. Filled with Scrambled Eggs, melted Cheese and Green Onions: Choice of Ham, Bacon, Sausage or Vegetarian. Buttermilk Pancakes served with Whipped Butter and Maple Syrup. We Offer Whole Wheat Options. Assorted Syrups at Client Request. Add Strawberries and Whipped Cream - 0.88. Thick Texas Toast Bread dipped in a Cinnamon, Nutmeg and Vanilla Egg Batter, grilled until Golden Brown and finished with Powdered Sugar and Cinnamon. Served with Whipped Butter and Maple Syrup). ½ lb. Hamburgers on Sesame Seed Buns and ½ lb. Hot Dogs on Stadium Rolls with Lettuce, Tomatoes, Onions, Pickle Relish, Cheese, Mayonnaise, Mustard and Ketchup with your choice of 2 Sides. Flame broiled Chicken Thighs/Drumbsticks, served with Osheas Specialty BBQ Sauce with your choice of 2 Sides. ¼ Rack of Pork Ribs Marinated and grilled, basted with Osheas Specialty BBQ Sauce with your choice of 2 Sides. 2 Skewers per Guest Mushrooms, Peppers, Onions and Meat of your Choice with your choice of 2 Sides. 6 oz. Rib Eye Steak marinated and char-grilled to Medium Rare unless otherwise specified with your choice of 2 Sides. 6 oz Alaska King Salmon seasoned and grilled, served with a Lemon Garlic Butter Sauce with your choice of 2 Sides. Rubbed with herbs and spices, marinated and smoked, served with Osheas Speciality BBQ Sauce with your choice of 2 Sides. Cole Slaw, Pasta Salad, Potato Salad, Macaroni Salad, Tossed Green Salad, Corn Cobbettes, Watermelon Wedges, Baked Beans with Bacon, Assorted Rolls with Butter, Honey Corn Bread. Seasonal Vegetables could include: Broccoli, Cauliflower, Yellow Squash, Zucchini, Carrots, Snow Peas, Mushrooms, Onions, Bell Peppers, roasted in Herb Butter. Long Grain Rice Pilaf with Mushrooms, Onions and Rosemary. Steamed and hollowed, piped with a blend of Sour Cream, Bacon, Chives and Cheese baked until Golden Brown. Your Choice of Fettuccine, Linguini, Rainbow Rotelli, Penne, Bow-Tie with Alfredo, Marinara, Pesto, Sundried Tomato Cream, Sundried Tomato with Pine Nuts, White Wine Butter Sauce and Roasted Red Pepper Sauce. Slow Cooked Baked Beans with Red Onion, Bacon, Brown Sugar and Honey. Bread Crumbs mixed with Celery, Onions, Sage, Garlic, Parsley and Butter in Chicken Stock and baked until Golden Brown. Apple Cider, Bacon Chive, Bleu Cheese, Caesar, Fat Free Raspberry Vinaigrette, Honey Lime, Honey Mustard, Italian, Oriental, Ranch and Southwest. Romaine Lettuce, grated Parmesan, Garlic Croutons served with Caesar Dressing. Julianne Carrots, Red and Green Cabbage in Traditional Dressing. Elbow Macaroni, Chopped Celery, Minced Onions, Roma Tomatoes, Mayo Dressing and Seasonings. Fresh Seasonal Fruit tossed with Honey. Baby Spinach, Bacon, Almonds, Black Olives, Mushrooms, Garlic Croutons, diced Egg, Gorgonzola Bleu Cheese, served with Bacon Chive Dressing. Romaine, Baby Spinach, Sundried Tomatoes, Parmesan, Garlic Croutons served with Caesar Dressing. Baby Spinach, toasted Pecans, Mandarin Orange, Granny Smith Apples and Gorgonzola Bleu Cheese Crumbles, served with Raspberry Vinaigrette. Romaine Lettuce, Carrots, Mushrooms, Cucumbers, Celery, Sunflower Seeds, Tomatoes, Black Olives and Avocado, Served with Honey Mustard Dressing. Romaine Lettuce, Cucumber, Red Onions, Roma Tomatoes, Kalamata Olives, Feta Cheese, served with a Red Wine Vinaigrette. All Lunch Bars include Paper Products. Homemade Bowl of Soup (Chef’s Choice) Choice of Salad: Tossed Green Salad - Romaine Lettuce, Grape Tomatoes, Shredded Carrots and Garlic Croutons; Caesar Salad - Romaine Lettuce, grated Parmesan, Garlic Croutons served with Caesar Dressing; Spinach Salad - Baby Spinach, Bacon, Almonds, Black Olives, Mushrooms, Garlic Croutons, diced Egg, Gorgonzola Bleu Cheese, served with Bacon Chive Dressing; Broccoli and Red Grape Salad - Romaine Lettuce, Broccoli, Red Grapes, Craisins, Bacon bits, Sunflower Seeds, Red Onions served with Apple Cider Dressing. Chef's Choice of Trayed Sandwiches; Could include - Assorted Croissant Sandwiches, Wraps, Etc. 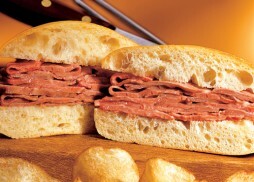 Trayed – Served with Lettuce, Tomato and Mayonnaise - Could Include: Roast Beef , Turkey, Ham, or Pastrami (Vegetarian Options provided at Customer Request). Choice of: Marinated and grilled Chicken - or - Seasoned Top Sirloin Strips cooked with Bell Peppers and Onion served with fresh Flour Tortillas, shredded Lettuce, diced Roma Tomatoes, Grated Monterey Jack and Cheddar Cheese, Sour Cream, Homemade Guacamole, Salsa, Spanish Rice and Refried Beans, Chips and Salsa. Choice of: Seasoned Ground Beef or Seasoned Chicken Breast, Tortilla Bowl, Flour and Corn Tortillas, shredded Lettuce, diced Roma Tomatoes, grated Monterey Jack and Cheddar Cheese, diced Red Sweet Onions, Sour Cream, homemade Guacamole, Salsa, Spanish Rice and Refried Beans. Choice of: Champagne Chicken or Tomato Basil Chicken (or combination of both), Choice of: Rosemary Roasted Potatoes, Roasted Potatoes with Parmesan, Rice Pilaf, Garden or Caesar Salad or Grilled Asparagus. Choice of: Teriyaki Chicken or Teriyaki Top Sirloin Strips with Oriental Salad, roasted Asian Style Vegetables, Yakisoba Noodles, and Sticky White Rice. Baked Potato Bar - 13.91 per guest. Add Homemade Soup or Chili 3.91 per guest. Add Sautéed Broccoli 2.37 per guest. Large Russet Potato served steaming hot and split open, ready for your choice of condiments: Bacon Bits, Sour Cream, Whipped Butter, Sliced Green Onions, Grated Monterey Jack and Cheddar Cheese, Broccoli and Red Grape Salad, Assorted Artesian Rolls and Butter. Choice of: Penne, Rotini, Linguini or Cheese Tortellini tossed with one of the following Sauces: Creamy Alfredo, Creamy Pesto, Marinara or Garlic, Olive Oil and White Wine served with Caesar Salad, Roasted Vegetables, Breadsticks. Romaine Lettuce, Roast Beef, Ham, Turkey, Tomatoes, Black Olives, Sunflower Seeds, diced Egg, Shredded Monterey Jack and Tillamook Cheddar served with Ranch Dressing. Romaine Lettuce, Turkey, Bacon, Tomatoes, diced Egg, Gorgonzola Bleu Cheese, Asparagus, Carrots and Avocado served with Bleu Cheese Dressing. Romaine Lettuce, Carrots, Mushrooms, Cucumbers, Celery, Sunflower Seeds, Tomatoes, Black Olives and Avocado served with Honey Mustard Dressing. Baby Spinach, Toasted Pecans, Mandarin Orange Granny Smith Apples, Gorgonzola Bleu Cheese served with Fat Free Raspberry Vinaigrette. Romaine Lettuce, Baby Spinach, Sundried Tomatoes, Grated Parmesan, Garlic Croutons served with Caesar Dressing (Add Chicken Strips 1.00). Spinach Leaves, Bacon, Almonds, Black Olives, Mushrooms, Garlic Croutons, diced Egg, Gorgonzola Bleu Cheese served with Bacon Chive Dressing. Crisp Romaine, Baby Spinach, Red Onion Rings, Four pan-seared Garlic Prawns, Parmesan, Tomato Wedges, garnished with Lemon Wedge served with Italian Dressing. Romaine Lettuce, Lightly marinated Chicken, Celery, Almonds, Sesame Seeds, Tomato Wedges served with Honey Lime Dressing. Romaine Lettuce, Bell Peppers, Green Onions, Mandarin Oranges, Sesame Seeds, Teriyaki marinated Yakisoba Noodles and Chicken served with Oriental Dressing. Romaine Lettuce, grated Parmesan, Garlic Croutons, sautéed Chicken Breast served with Caesar Dressing. Romaine Lettuce, Tortilla Chips, Bell Peppers, Shredded Monterey Jack and Tillamook Cheddar, Tomatoes, Fajita Chicken, Green Onions served with Southwest Dressing. Romaine Lettuce, Broccoli, Red Grapes, Sunflower Seeds, Bacon, Craisins, Red Onions served with our Apple Cider Dressing. Romaine Lettuce, Cucumbers, Greek Olives, Tomato, Bell Pepper, Red Onions served with Greek Dressing. Each Box Lunch includes Sandwich, Pasta Salad, Assorted Chips, Specialty Cookie, Seasonal Fruit, Soda or Water, Mint, Serviceware and Napkin. Smoked Turkey, Havarti Dill, Leaf Lettuce, Tomato, Basil Pesto Mayonnaise on Croissant. Bacon, Leaf Lettuce, Tomatoes, Avocado, Blue Cheese Dressing, Mayonnaise on Croissant. Roast Beef, Avocados, Red Onions, Tomatoes, Leaf Lettuce, Pepper Jack or Cheddar Cheese, Fajita Mayonnaise on Croissant. Roasted Turkey, Ham, Bacon, Swiss and Cheddar Cheese, Leaf Lettuce, Tomatoes, Deli Mustard, Ranch Dressing, Mayonnaise on Croissant. Roasted Turkey, Ham, Bacon, Tillamook Cheddar, aged Swiss, Leaf Lettuce, Tomato, Deli Mustard, Ranch Dressing, Mayonnaise on Dave's Killer Bread and Sourdough Bread. Roasted Turkey, Provolone, Tomatoes, Red Onions, Leaf Lettuce, Caesar Dressing on Foccacia Bread. Ham, Genoa Salami, Provolone, Pepperoncinis, Tomatoes, Red Onions, Leaf Lettuce, Italian Mayonnaise on Focaccia Bread. Fresh Garden Vegetables, Leaf Lettuce, Cream Cheese with Honey Mustard on Foccacia Bread. Bacon, Shredded Lettuce, Tomatoes, Avocado and Blue Cheese Dressing in a Roma Tomato Wrap. Roast Beef, Lettuce, Tomatoes, Parmesan Cheese, Pepperoni, Red Onions, Pepperconcinis and Italian Mayonnaise in a Roma Tomato Wrap. Garlic Chicken Breast, shredded Lettuce, Parmesan Cheese, Caesar Dressing in a Herb Garlic Wrap. Ham, Roasted Turkey, Bacon, Lettuce, Tomatoes, Shredded Monterey Jack and Tillamook Cheddar, Deli Mustard, Ranch Dressing and Mayo in a Herb Garlic Wrap. Turkey, Lettuce, Avocado, Tomatoes, Parmesan Cheese and Pesto Mayonnaise in a Spinach Wrap. Variety of Garden Vegetables, Cream Cheese, Shredded Lettuce, Avocado, Honey Mustard Dressing in a Spinach Wrap. Each Box Lunch includes Sandwich, Assorted Chips, Specialty Cookie, Seasonal Fruit, Soda or Water, Mint, Serviceware and Napkin. Fresh Vegetables, ripe Avocado, Spinach Leaves, Cream Cheese and Honey Mustard Dressing on Dave's Killer Bread. Creamy or crunchy Peanut Butter, Strawberry Jelly and Whipped Butter on White Bread. ¼ Rack of Pork Ribs marinated and grilled basted with Osheas Specialty BBQ Sauce. Boneless Pork Loin, seared to seal in the Natural Juices, baked with your choice of sauce: Teriyaki, Mango Chutney, Mustard Glaze or Bourbon. Boneless Pork Chops rubbed with seasonings and browned served with Apple Chutney. Granny Smith Apples, Red Onion and Garlic Stuffing, finished with a Mushroom Sauce. Wild Caught Salmon Fillets grilled and brushed with Lemon Garlic Butter. Wild Caught Salmon Fillets seasoned with Cajun Spices, finished with Salsa and Green Onions. Halibut Fillets grilled to seal in natural juices, finished with Lemon Thyme Butter. Layers of Lasagna Noodles, Italian Sausage, Cheeses and Marinara. Egg Noodles, Ricotta, Mozzarella, and Romano Cheese blended with Carrots, Spinach, Broccoli and Onions in Alfredo topped with Parmesan Cheese and Fresh Parsley. Fresh Seasonal Vegetables, tossed with Linguini, Garlic and Basil in a light White Wine Butter Sauce garnished with fresh Parmesan Cheese and Parsley. Spicy Italian Sausage Sautéed with Mushrooms, Bell Peppers and Onions served over Linguini in Garlic Marinara Sauce garnished with Parmesan Cheese and Parsley. Bay Shrimp, Salmon and Clams tossed with Linguini, Garlic and Basil in a Light White Wine Butter Sauce garnished with Parmesan Cheese and Parsley. Penne Noodles in a Tomato Sauce with Ground Beef, Pork, Garlic and Herbs. Tender pieces of Beef sautéed with Mushrooms and Onions in Creamy Beef Sauce served over Wide Egg Noodles. Braised Lamb, sautéed with Mushrooms in Savory Lemon Sauce served over Spelt Noodles. Tender strips of Chicken, Red Onions and Mushrooms tossed with Alfredo Sauce, served over Fettuccini Pasta. Smoked Salmon Slices and Mushrooms lightly sautéed with Garlic Cream Sauce and served on a bed of Fettuccine Noodles garnished with Parmesan Cheese. Large Shells Stuffed with Ricotta, Mozzarella and Romano Cheese finished with Parmesan, Parsley and Tomato Sauce. Yakisoba Noodles tossed with Seasonal Vegetables in a light Teriyaki Sauce. Slow Roasted with Carrots, Celery , Potatoes, and Onions finished with Brown Gravy. Rubbed with Herbs and Spices, slow-roasted and served with Horseradish Sauce. Grilled with our Steak Seasonings served with Creamy Horseradish Sauce. Roasted Chicken Breast basted with Sundried Tomato and Fresh Basil Cream Sauce. Chicken Breast baked and finished in a creamy Champagne Sauce with Mushrooms. Chicken Breast sautéed with Mushrooms, Parsley, Garlic, Marsala Wine and Green Onions. Chicken Breast seasoned with bread crumbs topped with Marinara and Parmesan Cheese. Baked Chicken Breast topped with sweet Mango and Spiced Ginger Chutney. Marinated Chicken Breast sautéed with Sliced Pears finished with a light Champagne Sauce. Chicken Breast filled with Prosciutto, Ricotta and Basil finished with Roasted Red Pepper Sauce. Chicken Breast stuffed with Ham and aged Swiss, lightly coated with Bread Crumbs and baked served with Garlic Cream Sauce. Boneless, Skinless Chicken Breast layered with Fresh Sage and Prosciutto finished with Mushroom Sauce. Boneless, Skinless Chicken Breast cooked in Mustard Sauce and Brussels Sprouts. Hummingbird Cake (12 Pieces) – $44.81 (Made with Stevia-63.86). Assorted Remlinger Farms Pies served with Fresh Whipped Cream (10 Pieces). May Include: Reese's Peanut Butter, White Chocolate Blueberry, Lemon Blueberry, Health Bar Crunch, Chocolate Chip Cocconut Triple Chocolate, Butterscotch and White Chocolate, Cranberry Orange White Chocolate, Lemon Basil Shortbread, Chocolate Chip and Oatmeal Raisin. May Include: Lemon Berry Jazz, Oreo, Chocolate Raspberry, Caramel Apple, Marble Cheese Truffles, Pecan Chocolate, Lemon and Strawberry Swirl Cheesecake. 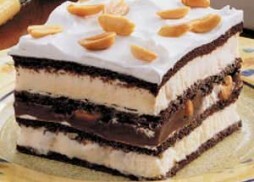 May Include: Individual Assorted Cakes, Cheesecakes & Mousses. Served with Strawberries and Whipped Cream SEASONAL. Fresh Seasonal Fruits displayed with Brie, Gorgonzola Bleu Cheese and White Cheddar. Genoa Salami, Prosciutto Ham, Tender Roast Beef, Fresh Mozzarella, Gorgonzola Bleu Cheese and Aged Parmesan with Marinated Vegetables. Cubed Swiss, Pepper Jack and Cheddar served with assorted Gourmet Crackers. Turkey, Ham, Roast Beef and Genoa Salami Cubed Swiss, Pepper Jack and Cheddar Cheese served with assorted Gourmet Crackers. Greek Style Hummus, Fresh Pita Bread, Kalamata Olives, Feta Cheese, Crisp Cucumber, Red Onions, Tomato and Pepperoncinis. Flavored with Paprika, Cilantro and Lemon Juice topped with Pico de Gallo. Rich Egg Bread braided into wreaths with Rosemary-Garlic Mayonnaise and your choice of filling: Roast Beef and Cheddar; Ham and Swiss; Turkey and Havarti; Vegetarian and Cream Cheese; Pastrami and Swiss; Tuna Salad with Dill Havarti Cheese (Whole Wreaths Only, 20 Slices per Wreath). Armenian Flat Bread rolled with your choice of filling: Italian Sausage with Roasted Red Peppers Cream Cheese; Italian Roast Beef with Avocado, Tomato and Horseradish; Mesquite Roasted Vegetables with Pesto Cream Cheese; Roasted Turkey with Sundried Tomato Cream Cheese; Garlic Chicken with Walnut Cilantro Cream Cheese; Smoked Salmon with Green Onions, Cucumbers and Pesto Cream Cheese. Succulent Prawns marinated in Lemon, Lime and Orange Zest with a Cilantro Lime Glaze. Bite Size Cakes made with Crab Meat, Garden Vegetables and Spices Blended together then baked and served with Lemon and Cocktail Sauce. Cream Cheese, Crab Meat, Artichoke Hearts, Red Onions, Roasted Red Bell Peppers, Parmesan Cheese and Seasonings baked and served with Garlic Toasted Baguettes. Smoked Salmon blended with Cream Cheese, Dill and Red Chilies, served with Garlic Toasted Baguettes. Red Roma and Sundried Tomatoes, Basil, Garlic and Mozzarella tossed in a Balsamic Vinaigrette served with Garlic Toasted Baguettes. Fresh Mozzarella, Grape Tomatoes and Fresh Basil drizzled with Extra Virgin Olive Oil. Assorted Sautéed Vegetables, Garlic and Herbs, blended with Cream Cheese and broiled until golden. Green Onions, Minced Garlic, Crumbled Bleu Cheese and toasted Pine Nuts. Artichoke Hearts, Roasted Red Peppers, Cream Cheese, Green Onions and Crab Meat filled Mushrooms. Phyllo Dough Triangles filled with Spinach and Ricotta Cheese. Bartlett Pear and Goat Cheese finished with Fresh Thyme and served with Butter Toasted Crostini. Baby Red Potatoes hollowed and roasted then filled with Cream Cheese, Mesquite Seasonings and Bacon and finished with a Chive Spear. Water Chestnuts wrapped with Bacon, served hot on a toothpick with Garlic Ranch Dip. Tender Pork Slices, served with Hot Mustard, Sweet Red Sauce and Sesame Seeds. Grilled Chicken, Mango, Pineapple, Red Onions and Green Peppers in a Cilantro Jalapeño Lime Glaze. Marinated Beef, Mushroom Caps, Bell Peppers and Onions glazed with Teriyaki Sauce. Ground Lamb blended with Rosemary, Feta, Garlic, served with Tomato, Bell Peppers and Mushrooms. 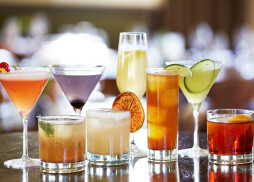 Know more about our delicious menus across Tacoma, Seattle, Bellevue, Renton, Kent, Redmond and the surrounding areas. Contact now to get a free estimate!